But critics point to a longer list of problems with the bill. It makes no mention of online trafficking, a growing problem as traders move to platforms such as Facebook and Kaskus, Indonesia’s largest internet forum. It doesn’t seem to address the issue of giving endangered animal parts as gifts — a practice still carried out in places like Papua province, where officials have been known to distribute souvenirs made from rare birds-of-paradise. Neither does it upgrade sentencing guidelines for wildlife crimes that conservationists say are in dire need of change. Under the current legislation, traffickers can receive a maximum sentence of five years in prison. But in reality, offenders are rarely prosecuted; on the few occasions they are, they typically receive token sentences far below the maximum. Conservationists have called for the introduction of minimum sentences to combat the problem. 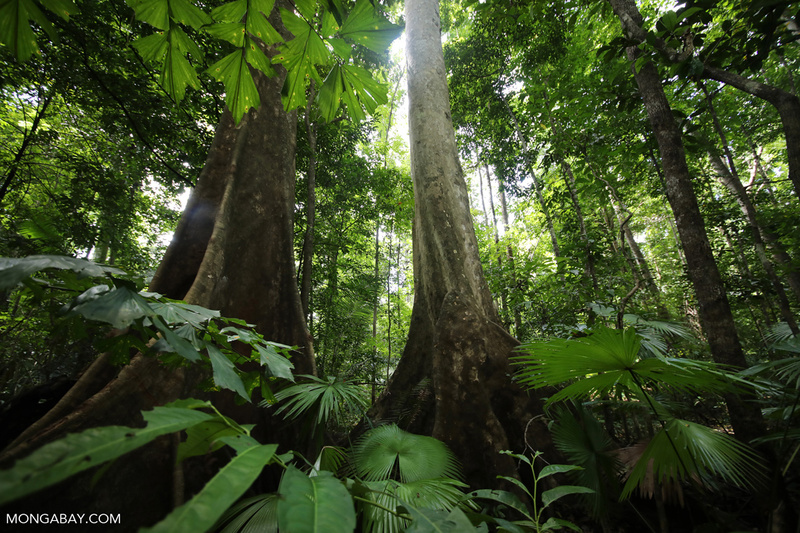 Trees in a rainforest in Sulawesi, one of the largest islands in the eastern part of Indonesia. Photo by Rhett A. Butler/Mongabay. Conservationists have long pushed for new legislation on wildlife crimes. Not long after a smuggler was arrested in 2015 with a suitcase full of rare cockatoos stuffed in plastic water bottles, prompting dozens of people to turn over their illegal pet birds to the authorities, the government announced plans to revise the 1990 law. Since then, myriad versions of the new conservation bill have been proposed by NGOs, the government and lawmakers. On Dec. 5 last year, the parliament officially submitted a bill to the government for review. Once the government signs off, the bill will go back to parliament for final passage at a plenary session. However, Justice Minister Yasonna Laoly told reporters on April 4 that the government would “hold off for the moment” on advancing the bill, as quoted by Kompas. Speaking after a cabinet meeting chaired by the president, he suggested the current law was adequate for addressing Indonesia’s conservation needs. It’s unclear what will happen with the bill now, but sources in the government told Mongabay the administration was unhappy with the draft submitted by parliament. One of the biggest differences between the existing legislation and the proposed bill is in the language around wildlife crime. The 1990 law clearly states that anyone who “trades, keeps, distributes or kills” a protected species has committed a crime, punishable with imprisonment of up to five years and a fine of up to 100 million rupiah ($7,000). Critics say the new language muddies the definition of what constitutes a wildlife crime, and would make it harder for authorities to crack down on the illegal trade in animals and plants. For a law to work well, “every prohibition must be clearly stated,” said Henri Subagiyo, executive director of the Indonesian Center for Environmental Law (ICEL). He suggested the new bill could effectively “legalize” wildlife trafficking if it was passed in its current state. 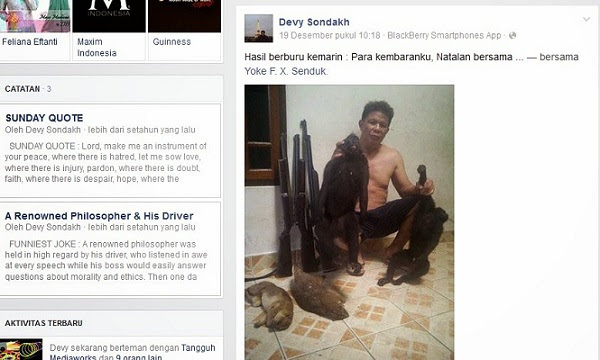 An Indonesian university lecturer was prosecuted by authorities after posting to Facebook pictures of endangered macaques he had killed. Photo: Facebook. In 2015, authorities in the port city of Surabaya arrested a man selling rare eagles on Facebook. The bust came amid a growing outcry over people showing off dead or abused animals on social media. Lawmaker Viva Yoga Mauladi said at the time that the revised bill would address online trafficking. Last year, the Wildlife Conservation Society, an international NGO that helps the Indonesian police catch traffickers, said that at least 40 percent of illegal wildlife traders in the country used online platforms such as WhatsApp to carry out their transactions since 2011. It also estimated the value of this illicit animal trade at 13 trillion rupiah ($910 million) a year. While existing legislation on electronic transactions does address the online wildlife trade, it is far from adequate to stem the actual practice, said Sofi Mardiah, wildlife police program manager at WCS-Indonesia. Any revised conservation law, she said, must lay the foundation for a monitoring scheme that filters out wildlife or products made using animal parts from online platforms, including social media and e-commerce sites, where the trade is prevalent. “Wildlife traffickers are looking for stealthy ways and means to trade the animals,” she said. Other provisions in the revised conservation bill could create loopholes for traffickers, critics say. The same article could conceivably be used to waive charges against people who kill protected animals, such as orangutans, on the basis of self-defense, Henri said. A number of wildlife killings by locals who claimed they were attacked by the animals have been reported in recent months. Two rubber farmers in Central Kalimantan province beheaded and shot an orangutan multiple times in late December for allegedly charging at one of them when they tried to scare the ape away from their plantation. In January, four farmers in East Kalimantan also cited self-defense for the killing of an orangutan they shot at least 130 times. In March, villagers in northern Sumatra stabbed a Sumatran tiger to death after it attacked and injured two men from a hunting party that had been trying to get the animal away from their village. 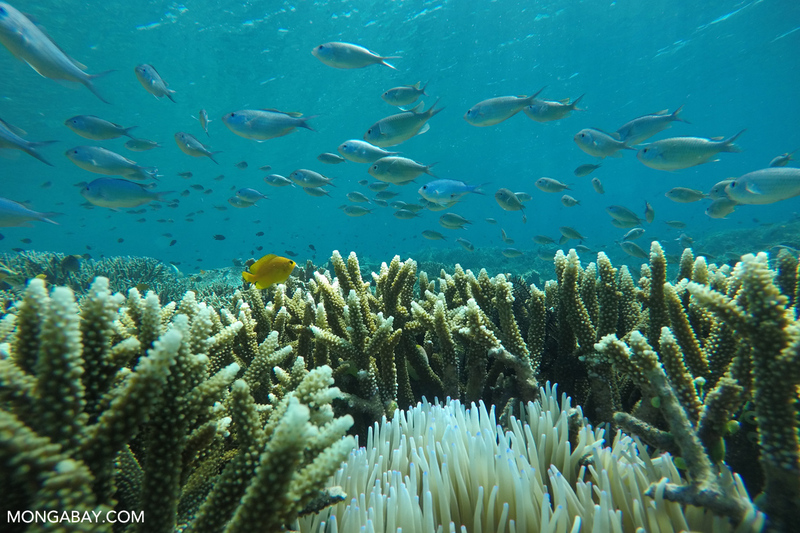 An underwater ecosystem in a marine national park in the Komodo Islands of Indonesia. Photo by Rhett A. Butler/Mongabay. Another major change in the conservation bill is that it would open up conservation areas, except nature reserves and the core zone of national parks, to so-called strategic development projects. The move is seen as a nod to the energy industry, which has long sought access to Indonesia’s world-leading geothermal reserves but been thwarted by existing protections under the current conservation act. Much of Indonesia’s geothermal potential is believed to be locked deep under existing conservation areas, for which exploration permits currently cannot be issued. The proposed revision has drawn criticism from conservationists, who say it provides a loophole to allow operators in the extractive industries to exploit more protected areas. The government convened a cabinet meeting on April 4 to discuss the draft bill submitted by parliament, but looks to be in no rush to send it back for passage. The meeting, meant to generate feedback and concerns over the content of the bill, concluded with President Joko Widodo ordering his ministers to ensure the bill was aligned with the constitution and would benefit Indonesia in the long run. Environment and Forestry Ministry Siti Nurbaya Bakar told Mongabay her office would discuss the cabinet’s feedback with parliament to perfect the bill, but Justice Minister Yasonna suggested there was no need for the bill at all. He also noted that the bill as it stands would require at least 30 supporting regulations to clarify some of the new provisions. ICEL’s Henri called for the discussion to continue, citing a pressing need to revise the current law. He said he hoped the review would be transparent so that civil society groups could weigh in on the process. “The longer we wait to discuss the bill, the more time we give companies to continue manipulating the current conservation law,” he said.